Read the text below and then listen to the TED talk to hear the missing words. (Write the exact word/s that you hear.) Complete the text below using NO MORE THAN THREE WORDS OR A NUMBER. The speaker tells us about death and architecture. She says that a hundred years ago, we tended to die of infectious diseases like pneumonia and that, if they could take us away (1) __________. We tended to die at home, in our own beds, looked after by family, although that was partly because many people lacked (2) __________ medical care. By the 20th century a lot of things had changed. We (3) __________ like penicillin so that infectious diseases could be treated. New medical technologies like x-ray machines were invented. And because they were so (4) __________ and expensive we needed large, centralized buildings to house them and these buildings became our modern hospitals. After the Second World War, many countries set up universal healthcare systems so that everyone (5) __________ treatment could get it. The result was that lifespans extended from about 45 at the start of the century to almost double that today. The 20th century was this time of huge optimism about what science could offer, but with all of the focus on life, death was forgotten, even as our approach to death changed dramatically. Now pause the video while you check your answers. Then read questions 6 – 10 below the video. 6. The speaker is a doctor. 7. Hospital architecture has a bad reputation. 8. L’Ospedale degli Innocenti was built in 1940. 9. We don’t talk about death because we find the subject to be uncomfortable. 10. The first crematorium in the UK was built in Woking in the 1870s. Now check your answers below. 6. F, 7. T, 8.F, 9.T, 10.T. Read the questions and then listen to the TED talk to answer them. Complete the text below using no more than three words or a number. After the West side Cowboy started working around (1)_______________ was killed each month. So they decide to solve the problem of the danger – they (2)_______________ it. The line continued until (3)_______________ when the last train ran. Initially only (4)_______________ people were interested in the project. At first they wanted to save the highline, but later they conceived the idea of developing it. The speaker loved the fact that a mile-and-a-half of (5)_______________ ran right through the city. When Mayor Bloomberg came to office, he was (6)_______________. When the first section of the project opened in 2009 it was visited by 2 million people. This was (7)_______________ times the predicted number. In the future Section Two will open followed by Section Three which will go around the (8)_______________. Jessi buys all her clothes second hand from flea markets and dress stores. Second hand (1)_______________ enables reduction of the impact on the (2)_______________ and on her wallet. Advantages include money going to a good cause, unique appearance and the fun of turning shopping into a personal (3)_______________ hunt. Answer the following questions with no more than three words or a number. ANSWERS – out of order! To ‘inhibit‘ means to stop someone or something from doing or saying something that they should do or that they want to do. Lack of sunshine and water will inhibit the growth of plants. Fear can inhibit people from expressing their opinions. Note that different collocations can have quite different meanings. They are not always alternatives. Complete the sentences. 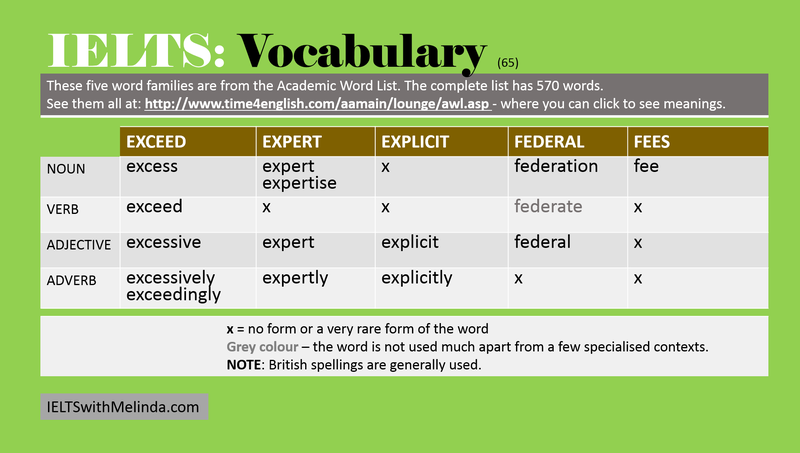 Choose the correct word and then use the correct form of the word. 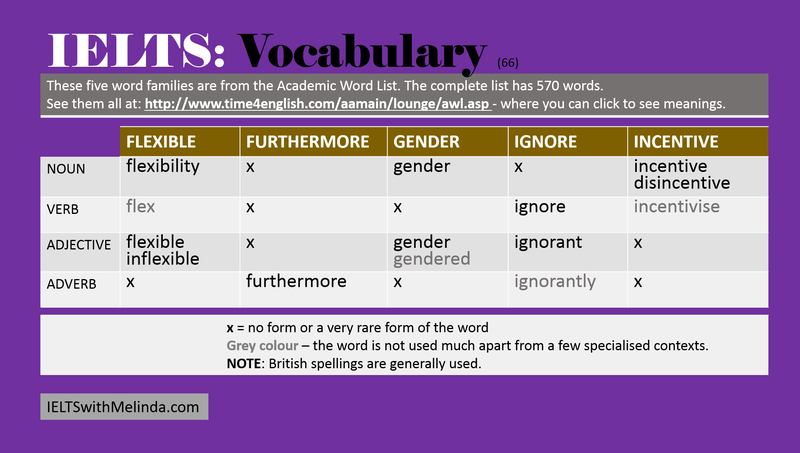 ‘Furthermore‘ is quite formal and it is used when you want to add more information. 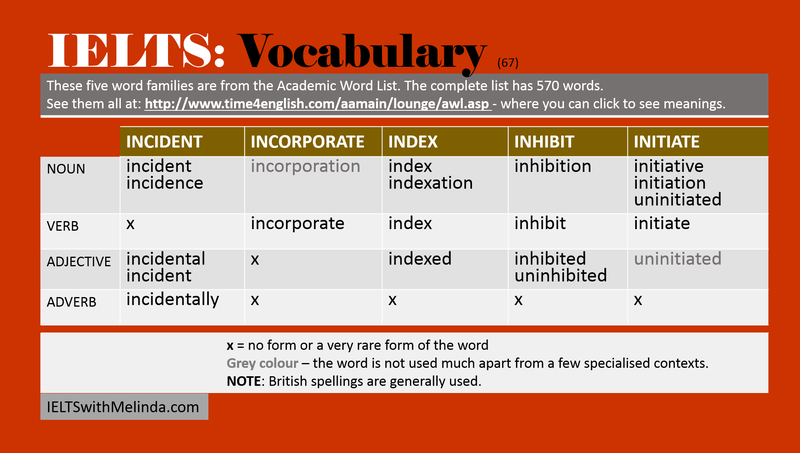 It could be used in academic essays and formal or legal documents. It may be used in spoken English, but not in everyday conversation. The shopkeeper was charged with deceptive practices and was ordered to pay a sum of $1240 to each of his victims. Furthermore he was banned from trading for a period of two years. ‘Exceed‘ means to do more than is allowed or more than is required. It can be a good thing or a bad thing. For example, if you exceed the speed limit when you are driving, that is not good because it is dangerous and you may get a fine. To exceed the results you need for IELTS would be a good thing. I had to pay and extra $380 at the airport because my luggage exceeded the weight allowance. I was hoping to get an overall B for my Year 12 results so that I could get into a Nursing course at university. But I exceeded my expectations. I got an A, so now I am thinking about applying for Medicine instead.